I’m one of those people who doesn’t feel particularly proud or accomplished, much more aware of what I haven’t done — and maybe can’t ever do — than what’s already past. I know, I know. But that’s just how I’m built, so you’ll have to write a letter to the manufacturer. The truth is, I got a few great letters recently. I haven’t been sharing them of late, or been particularly tuned into the “James Preller” franchise — this business of being “James Preller” — just generally weary of this Industry of Self. Not the writing, not the books, not the real work: that stuff is great. Anyway, here’s a letter from someone I met long ago . . .
I’m sure you wouldn’t recognize my name, but my name is Katie F. and I was in Ms. Goeke’s 2nd grade class when you visited back in ’98. Now I am 22 and about to graduate with my MBA, my how time flies! I still own the first couple of Jigsaw Jones books, and while reorganizing my bookshelf to make room for some textbooks I came across the second book, The Case of the Secret Valentine. 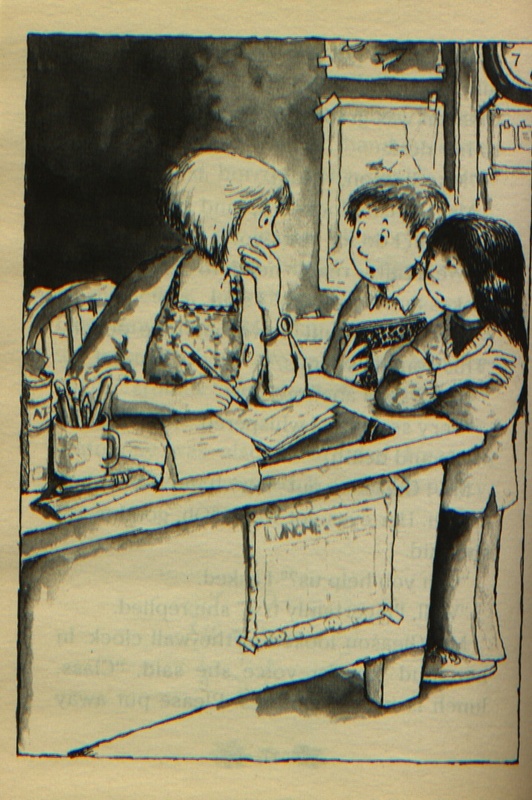 I remember vaguely having a visitor in the class who Ms. Goeke had explained was an author. However, I had completely forgotten that my name is on the second page! You have clearly had great success with this series, I see there have been many more books published since I left that target age group; congratulations! My question is, what inspired the main idea of the series? The characters? Did you already have a kids detective series in your head when you came to observe my class? I used to jokingly tell people I inspired a kid’s series in elementary school because I used to play detective on the playground all of the time back then. I doubt I was actually the true inspiration, so I was wondering if you didn’t mind sharing that with me? I’ve been very curious! Apologies if you have already answered this question on your blog somewhere! Oh, hey, Katie, I didn’t see you standing there! Thank you so much for that remarkable letter. I remember that time well, though you are correct, the names of the individual students in that class have long since slipped away. It was important to me to write accurately about the school life of children. Fortunately, I knew your teacher, Jen Goeke, and she welcomed me into her classroom. I visited many times, actually. In fact, I loosely modeled Jigsaw’s teacher, Ms. Gleason, after your (our!) Ms. Goeke. I admired so many of the little things so did with her students, the affection, the calm, the deft way of balancing the needs of individuals with the pedagogical objectives of the classroom. I’m sure you’ll agree, mostly she was really, really nice. There’s a lot of Ms. Goeke in those books. I love this illustration by R. W. Alley from the first book in the series, The Case of Hermie the Missing Hamster. “We really, really need to learn about snakes and hamsters,” I said. Ms. Gleason put her hand over her mouth. Her eyes got wide. “Oh, goodness,” she said. Yes, I see that you are right. I dedicated book #3, The Case of the Secret Valentine, to the students in your 2nd-grade class. One other thing I tried to put into those books, and that I re-learned partly from those visits with Ms. Goeke, was how a child can truly and deeply fall in love with his or her teacher. She was beautiful and lovely and most of all she was kind. I wanted to pay tribute to that. I am sorry to say that you were not the inspiration for the series. (Actually, my team of lawyers has advised me to say that, in fear you will be seeking a claim on royalties earned.) I already had the basics in mind before I walked into your classroom. But I did get inspired there, and I’m sure you played a part in that. I wonder: Do you have a class picture? Could you send a file to me? I’d love to see one, if that isn’t too much to ask. Thank you for taking the time to write. I was nice for me to find an excuse to revisit those times and that place. Congratulations on your MBA. Now go out there and fix the world! That was one of the things I learned, you know. Hopefulness. Belief in a better future. I’d sit in that classroom, surrounded by kids exactly like you, who were being taught by a young woman like Jen Goeke, and I knew that somehow we’d make it through, that it would all be all right somehow.